Storms are a powerful force and can cause severe damage to your trees and residential or commercial properties in Ajax. That is why our team at Ajax Tree Service is standing by to be there when you need us most. Your home is the safe place you and your family retreat to but when it a victim of storm damage due to fallen trees, it can be devastating and dangerous. Our tree services are great for the prevention of tree storm damage and the remedy should you need a help with any tree related storm damage in Ajax. ​Call us today and we will come out and provide a free estimate of service. No one ever thinks they will be impacted personally by a storm and need storm clean up services in Ajax. Should that day ever come, you can count on Ajax Tree Service to come in and clean up the debris and fallen trees as needed. After all, the first thing you need to do to get your life back after a storm is clean up and why would you want to do that alone when you can call us to handle all of your storm damage debris? Our team comes prepared for the worst of situations when it comes to storm damage, we have seen it all. From tree removal services after your roof is smashed through to fallen branch pickup, we are your storm damage cleanup crew! Our tree removal and trimming services come in handy when trying to prevent storm damage. Overtime your trees can become weak and easily break resulting in potential storm damage during the next high wind storm. At Ajax Tree Service, we want to work with you to prevent future storm damage as much as possible. Before ice storm season hits, let our team come out and inspect your property to see if there is any risk of tree damage. Our technicians are experienced in spotting the high risk tree species and other signs that point to the potential your trees may cause damage during the next storm. Contact us today for storm damage prevention and stay one step ahead of the storm! Is Tree Topping Good For Storm Damage Prevention? Tree topping is not how to prune a tree – proper tree pruning can help the tree thrive and remove dead branches that might cause problems during a storm but tree topping can cause health issues not to mention it makes the trees ugly. Tree topping increases tree maintenance – by weakening the tree with tree topping methods, the tree will then require high-maintenance or the tree may become a hazard. If you have any questions regarding tree topping or how to prepare your trees for a storm, contact us today! 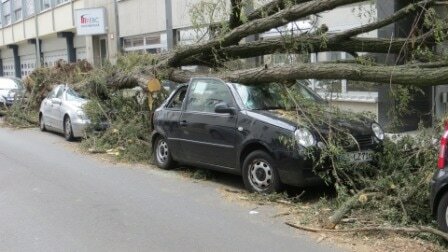 Our team at Tree Service Ajax is here to help with all your storm damage needs!